as published in "The Human Weapon"
Taekwon-Do was brought into this world on April 11, 1955. Before this time, there was no Taekwon-Do, no Chonji or Dan-Gun tul; the original Taekwon-Do patterns. In 1957, General Choi Hong Hi who also was elected as its first president established the Korean Taekwon-Do Association. It is impossible to explain the history of Taekwon-Do without mentioning General Choi Hong Hi, the president of the ITF. General Choi was born in 1918, in a small, rural village in what is now North Korea called Ham Kyung Buk Do, Myung Chun Gun Hwa Dae Myun. When was young, his parents were concerned because his body was frail and weak, although he was independent and very responsible. The young boy, like the future General he would one day become, was strong on the inside in mind and spirit. When he was 12 years old, he was expelled from school for being an agitator to the Japanese authorities. Japan occupied the Korean peninsula at the time. His parents enrolled him in a private school where he studied calligraphy under the renowned Mr. Han IL Dong. Coincidentally, Han also happened to be a Master of Taekyon, the Korean art of foot fighting. Taekyon dates back to about 200-300 years ago because Taekyon can only be written with a Korean alphabet. The Korean alphabet was developed only several hundred years ago. But in the history of Korea, other martial arts, such as Soo Bak Gi, have been practiced since ancient times. 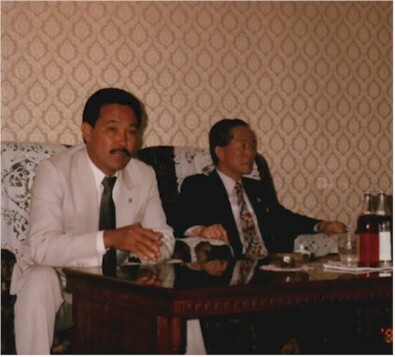 While General Choi was in Kyoto, Japan, he met a fellow Korean by the name of Mr. Kim Hyun Soo. 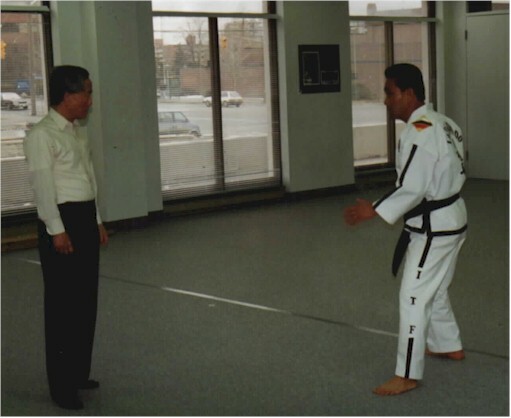 Mr., Kim introduced karate to General Choi. This experience along with his knowledge of Taekyon influenced his development of the new Korean martial art of "Taekwon-Do". Taekwon-Do movements and techniques are scientifically designed to create power. Compared with other martial arts, Taekwon-Do is well structured, using descriptive terminology for the anatomy and physics, with well-established rules of competition. However, Taekwon-Do is similar to other martial arts in its original purpose. Large or small, young or old, male or female, anyone can benefit from and enjoy practicing Taekwon-Do and learn to create maximum power. All the techniques and theories of Taekwon-Do are contained in a 15-volume encyclopedia originally published in 1980. 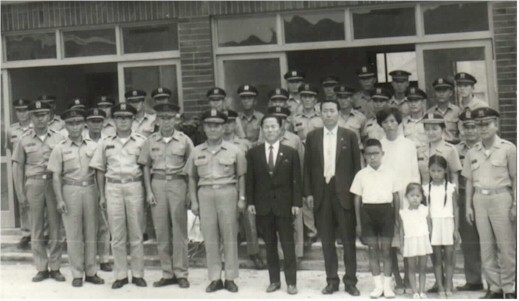 General Choi not only proposed the name "Taekwon-Do", but also developed the techniques, the terminology, and it's system for teaching and training. His comprehensive book on Taekwon-Do allowed him to reach millions of students throughout the world. General Choi personally taught Taekwon-Do himself throughout the world, gaining many faithful students. When World War II broke out, General Choi was drafted against his will into the Japanese army as a "student soldier". 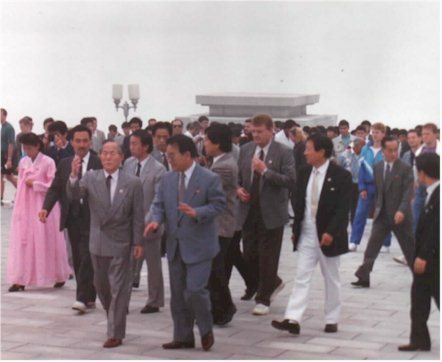 While stationed at Pyongyang, North Korea, he planned an insurrection as part of the Korean Independence Movement called the Pyongyang Students' Soldiers' Movement. He was turned into Japanese authorities and was interned at a Japanese prison camp. He was freed the day after Japan surrendered, August 15, 1945, ending World War II. That was how he saved his life and began a second life. While in the solitude of his jail cell, he practiced martial arts training with his bare hands and feet on a cold concrete floor. He promised himself that if he were ever to live in freedom, he would dedicate his entire life to building Korea's martial arts program. There is an Oriental expression that disaster will turn to happiness and happiness will turn to disaster. If General Choi had been a nine foot tall giant, Taekwon-Do would probably not exist If Korea had not endured 36 years of occupation by the Japanese, General Choi might not have developed patience; the patience that enabled him to establish Korea's own martial art. It is difficult to imagine but Japan's attempt to destroy Korean culture inspired General to create a martial art for 20 million Koreans. Taekwon-Do has twenty-four unique patterns developed by General Choi. Reason being is that when you consider eternity, the life time of one person, perhaps one hundred years; is only a day. Therefore the twenty-four patterns represent twenty-four hours of the day, or the lifetime of General Choi, his legacy to the human race. The first of these patterns is named "Chon-ji" which means "heaven and earth". It is interpreted in the orient as the creation of the universe and the beginning of human history; therefore, it is the pattern practiced by the beginner. The next pattern is called "Dan-Gun". and as any Korean is well aware, Dan-Gun is the legendary founder of Korea. The next pattern is called "Do-San". Do-San is the pseudonym of the patriot Ahn Chang-ho, (1876-1938), who devoted his entire life to the education of Korea and its independence movement. The next patterns are Won-Hyo", a noted monk, and 'Yol-Gok", a great philosopher. Joong-Gun, the next pattern, was named after the patriot Ahn-Joong Gun. The 32 movements in this pattern represent his age when he was executed in Liu Shung prison in 1910. Subsequent patterns are Tae-Gae, Hwa-Rang and Choong-Moo, the name given to Admiral Yi Soon-Sin. The final pattern is called "Tong-IL". Tong-IL denotes the reunification of Korea, which is General Choi's lifetime wish. As I speak of the origin of Taekwon-Do, I must mention the period of Japanese occupation of Korea. It was a time of great hardship for the Korean people. It is not my intention to offend our neighboring country, but this period deeply influenced General Choi and the development of Taekwon-Do and I am compelled to discuss its impact. From 1946 to 1954, General Choi studied and developed this new Korean martial art. On April 11, 1955, General Choi convened a meeting of prominent Koreans including leaders in Congress, politicians, military Generals, historians, artisans, and martial art experts, for the purpose of naming this art. General Choi proposed the name "Taekwon-Do" and it was unanimously accepted. These were the circumstances under which Taekwon-Do was born and became Korea's new martial art. In 1959, General Choi established the Korean Taekwon-Do Association and was elected as its first President. He was a founding member of the Korean military and served as Commander of the Infantry Division, Commander of Army Training Center and Commander of Army Corps. Through these positions, General Choi incorporated Taekwon-Do into the daily training regimen of the entire Korean military. In 1961, Taekwon-Do spread to colleges, government offices, and police academies. This started a real boom in the expansion of Taekwon-Do. Finally, in 1965, Taekwon-Do became the official Korean national martial art. The International Taekwon-Do Federation (ITF) was founded on March 22, 1966. The original member countries were; USA, West Germany, Italy, Egypt, Turkey, Malaysia, Singapore, Vietnam and Korea. 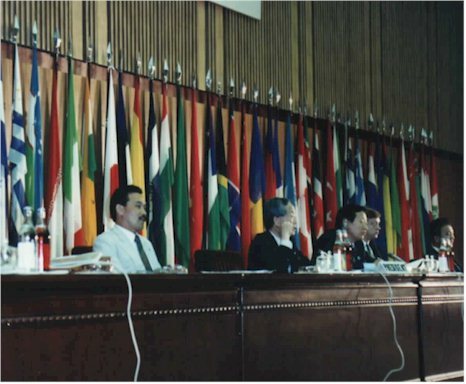 The ITF was the first international organization headquartered in Korea. Unfortunately, Korea was governed by several military dictatorships for a period over 30 years. This marked the beginning of a period of trials for Taekwon-Do. Using the name of Taekwon-Do, many phony organizations appeared as political tools, cheapening Taekwon-Do into a commercial sport. Every student of Taekwon-Do must endeavor to sacrifice for the unification of Taekwon-Do. Martial artists, not politicians, must decide the destiny of Taekwon-Do. The unification of Taekwon-Do is inevitable. Taekwon-Do is our life and we must pass a single united Taekwon- Do down to the next generation. All martial arts should insist that the influence of politicians should be removed from martial arts organizations. We must rebuild our martial arts organizations with martial artists only. We cannot ask anyone else to conduct our business or define our mission. We cannot pass this responsibility to others. We must ensure the next generation receives its rightful inheritance. Grand Master Hwang, Kwang S.